There is more than one way for hybrid vehicle owners to get the best fuel economy. Car makers and government regulators can promise consumers that driving hybrid cars will help improve their fuel economy, but the reality is that if hybrid vehicle drivers want to get as many miles per gallon of fuel as they can out of their electric motor and gas engine vehicle, keep more money in their pocket, and be friendlier to the environment, it is primarily up to them to be more conscious of their driving style and make good use of a tire pressure gauge. Use ECO mode for highway driving and EV mode for short trips. According to Autos Cheat Sheet, many hybrid vehicle models, particularly the newer models, have been designed to offer drivers different driving modes. For instance, many hybrids have an EV mode that enables drivers to primarily use the electric battery to power the vehicle. While this mode is ideal for short trips and will provide peak economy during times when cruising, this mode is not good for highway driving or driving that requires frequent acceleration. The reason is this is a fast way to waste the battery. For highway driving, ECO mode is a better option, because it will stop a hybrid car’s battery from draining every time the accelerator is hit. A gasoline engine is far more suitable for acceleration. In addition to choosing the right driving mode, it is also important for drivers to be smooth when driving and not to drive heavy footed, to prevent losing more fuel than is necessary. Likewise, driver’s who anticipate stopping and ease their foot off the gas and come to a gradual stop, will also make the most of their fuel economy by not wasting fuel or unnecessarily draining the battery. 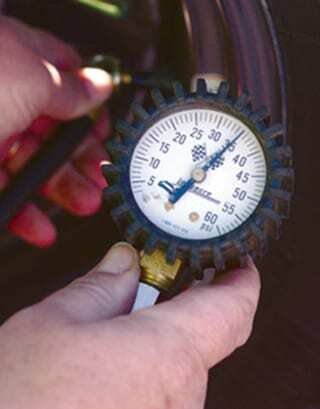 A tire pressure gauge helps to ensure tire pressure is where it should be. Another simple and easy way hybrid drivers can ensure the best fuel economy is to always make sure that their car’s tire pressure is maintained at the right level. A typical tire can lose 1 to 2 psi per month, which is why it is important that tires are checked so that they can be properly adjusted. When tire pressure is too low, too much of the tire’s surface area touches the ground, which boosts the friction between the tire and the road. This can result in tires wearing prematurely, which means replacing them sooner rather than later. Equally, if the pressure in tires is too high, less of the tire touches the road. This not only results in a bouncier ride, but there is less traction, which means that stopping distance is affected. The easiest way for a driver to check the pressure of their tires, is with a tire pressure gauge. There are many different tools on the market, such as the Mogix digital tire pressure gauge, which not only measure pressures, but is also a handy portable tool with other features including an emergency seat belt cutter, flashlight, glass breaker, and more. The bottom line is that to obtain the best fuel economy for any vehicle, drivers need to not only purchase the most fuel efficient cars, but ensure that they are driving in the most fuel efficient-friendly way.